Globally, 90% production of rice is in Asia, but U.S. is major exporter of rice, majorly to Mexico, Northeast Asia, Central America, the Caribbean, Canada, the Middle East, the European Union, and Sub-Saharan Africa. Asian aromatic rice such as Basmati and Jasmine rice are majorly imported by the U.S.A. United States accounts 2% of global rice production and 10% of global exports. Major exported rice varieties are rough rice, brown rice, parboiled rice and fully milled rice There are 1000 of varieties of rice produced worldwide and 20 types of rice are commercially produced in U.S., majorly in states of Texas, Arkansas, Mississippi, California, Louisiana and Missouri. U.S. rice exported is regulated by the agreements between The World Trade Organization (WTO) and the North American Free Trade Agreement (NAFTA), and thus it has resulted in spurring rice exports from the United States. Goldstein Research analyst forecast that the United States rice industry size is valued at USD 2.30 billion in 2017, growing at a CAGR of 1.3% over the forecast period. Government support in rice production, growing demand for rice in various application, rising number of rice processing companies, increasing exports are some of the factors impacting the growth of U.S. rice industry. 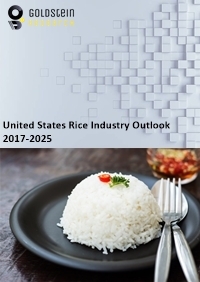 The report covers the present ground scenario and the future growth prospects of the rice industry for 2017-2025 along with the United States sales of rice and United States revenue of rice. We calculated the market size and revenue share on the basis of revenue generated from major players involved in rice processing across United States. We have forecast the market on the basis of producers, suppliers and distributors, exporters and importers. On the basis of grain size type, short and medium grain accounted for largest market share in 2017 with 85% of total rice production. Over the forecast period short and medium grain rice are expected to continue their dominance in the rice production. Based on application, 58% rice is for food use, 16% for food and beer processing and 10% is used in pet food. Rice industry outlook 2017-2025, has been prepared based on an in-depth market analysis from industry experts. The report covers the competitive landscape and current position of major players in the rice industry. The report also includes porter’s five force model, SWOT analysis, company profiling, business strategies of market players and their business models. United States rice industry report also recognizes value chain analysis to understand the cost differentiation to provide competitive advantage to the existing and new entry players. In the era of technology advancement, there is trend of producing genetically modified (GM) rice to ascertain the quality of rice and food security. Though commercially there is no production of GM rice, but many varieties have been approved for commercial production which is expected to boost the United States rice industry. Rice is a staple crop for 70% of the world and thus the demand for rice is expected to continue to grow over the forecast period. The food security concerns all over the world is driving the growth of the United States rice industry, which by exporting rice to various countries is contributing towards global food security. Based on geography, Arkansas amounted to 80,900 million cwt. production of rice, acquiring the highest position in rice producing states of U.S.A. Arkansas is followed by California and Louisiana in terms of rice production. California majorly produces short and medium grain japonica variety of rice. United States Rice industry report comprises of the following companies as the key players in the Rice industry: Cache River Valley Seed LLC, Cormier Rice Milling Co., Inc., Crop Marketing Services, Inc., American Commodity Company, LLC, California Family Foods, Farmers' Rice Cooperative, Bertrand Rice, LLC, Big River Rice and Grain, Farmers Rice Milling Co., Inc.